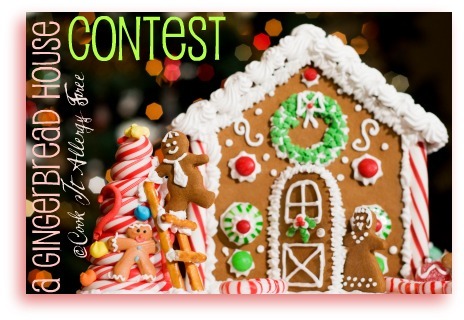 A Gluten Free Gingerbread House Contest…Win an iPod Touch! Thanksgiving feast? Done. Leftovers? Polished off. Tired feet? Recovered. Black Friday? Behind us. In our house, this means that the holidays have officially begun. My husband is currently outside competing with Clark Griswold while decorating our house in lights. I am fairly certain he is aiming to blind the neighbors and dramatically increase traffic down our normally wonderfully quiet street. Setting the lights to music with one of those crazy computer set-ups is a new touch this year, and one that will probably draw more onlookers than I care for. I am apologizing in advance to my Gxxxxxx Drive neighbors (thank goodness I am friends with all of you and can bribe you with food). I am currently inside multi-tasking (which, according to the latest studies, does not, in fact, make you any more productive). My house is half-decorated, cookies are waiting to be made, laundry is in need of folding, and I just remembered that it would be a great time to fill you in on a fun event that I am hosting over here at Cook It Allergy Free…. A GINGERBREAD HOUSE CONTEST with a special prize for the winner – A New 4th Generation iPod Touch and a free download of my Cook It Allergy Free iPhone App. ->Apple, the Apple logo and iTunes are trademarks of Apple Computer, Inc., registered in the U.S. and other countries. iPod is a trademark of Apple Computer, Inc.
->Formatted capacity may vary. Results will vary based on file size and format, settings, features, software and other factors. Because I just happen to have an extra 4th Generation iPod Touch from a charity event that we were a part of, I thought it would be fun to host a contest here and have my readers submit photos of their homemade gingerbread houses. Everyone can vote on their favorite creations (in the comments sections) and the house with the most votes will win the iPod Touch (p.s. there may be a prize for the runner up as well, hint hint). 1. The house can be a theme based on any religious preference. 2. The house can be as creative or simple as you want. Just have fun with it. 4. I know that I cannot prove whether or not the house that you submit is yours. But, I hope in the honest spirit of the holidays, I can count on the fact that the house you share with us was created either by you, or by a member of your family. 5. Please email me a photo of your gingerbread house by December 9th. You can email your photo entries directly to: help AT cookitallergyfree DOT com (obviously replacing the AT and DOT with the appropriate characters). 6. The post will go live on Friday, December 10th. The voting will last for 1 week. The winner will be announced on Friday, December 17th (so that there is time to mail the iPod Touch to the winner before the holiday). 7. I will post each photo, assigned with a number instead of a name. This way you can vote for the house, not the person, that you like best. You can vote, by the number, in the comments section. I will list who submitted photos at the top of the contest post (with links to any of you who have blogs). But, so that this contest remains fair, I will not match the photo with the submitter until the day that the contest is over. And after your kids (or you) are finished mindlessly nibbling on that array of colorful candy while you are busy building that house, you can go over and check out how to counteract that food-dye/sugar-high with a rainbow of different sorts. Maggie, of She Let Them Eat Cake, has a great review of the Today I Ate A Rainbow Kit, which is an awesome way to teach your kids the importance of eating a variety of fruits and vegetables (and when better to capitalize on these points than during the time of year that they are consuming more sugar than their little bodies are used to). And, by the way, Maggie is doing a giveaway of one of these kits on her blog right now. NOW…GO GET STARTED ON THAT HOUSE. PERHAPS YOU HAVE SOME LEFTOVER HALLOWEEN CANDY THAT IS NEEDING A HOME (LITERALLY) OR SOME HOLIDAY CANDY THAT IS ALREADY BECOMING TOO TEMPTING TO IGNORE. PERHAPS IF THESE SWEETS ARE GLUED WITH ICING TO YOUR HOUSE YOU WILL BE LESS LIKELY TO INDULGE IN THEM (or maybe that will not stop you – see 2 year old above). I CANNOT WAIT TO SEE YOUR CREATIONS! Oh, how fun! I will have to see if I can squeeze this in. Great contest! Oh cool, Jeanine! I hope you join in! 😉 Thanks so much! Oh my gosh, you girls are about to send me over the garland-trimmed edge. I can’t keep up with the basics, let alone make a gingerbread house. I’m not even going to pretend to think about this for one second. If I did, I’d have a mini nervous breakdown. I’m still trying to do a blog post to follow up Shauna’s round-up of GF holiday dishes (what was that, 2-3 weeks ago?). Having said that, I’ll follow along from a distance and enjoy the festivities on your blog. Can’t wait to see the outcomes. I hosted a wonderful Thanksgiving though, complete with GF everything. All went well until I dropped my pumpkin custard pie onto the INSIDE of the hot oven door while removing it from the oven. What a mess! Thankfully I had just completed a 100 hour yoga immersion. Very mellow. Breathe in, breathe out and grab a spoon. We ate dessert off the oven door and had a blast doing so. Here’s to a great contest at Cook it Allergy Free. I’ll be back to check out the final gingerbread houses (just typing that gives me the willies). No worries about not joining in on the contest! This is such a crazy time of year – I just figured it would be fun for those who were planning on making a house anyway! So glad you had a wonderful and calm Thanksgiving, spilled custard pie and all! LOL I almost fell off the couch laughing between Kim’s hilarious intro and Melissa’s comment!! Love you ladies! I have nothing constructive to add, there is no way in gluten free heaven or hell that I have the talent/patience/creativity for a gingerbread house. But I must see photos of your house Kim. There is no comparison to the Griswold’s without pics. LOL! Erin, you crack me up! However, I could only imagine the comical house you could whip up yourself. I will try and post a picture of the outside of our house (our real one) with all the lights! Seriously, hubby went overboard this year. And yes, Melissa’s comment was too freaking funny! Love the pretty button for this event and ooh la la on the prize … your app makes that the best prize! Thanks so much for directing everyone over to my blog for the giveaway and product review! You rock. Haha! Thanks Maggie! He had no idea I was watching him set up his little stool and stealing the candy. It was just too cute to stop him. I cannot wait to see your house! So cool that it is still standing! LOL Woohoo! I really hope to have time for this! It sounds like so much fun! I haven’t made a gingerbread house since I was a little kid. is this contest available to residents of Canada, or is it just the US? Yay! I am going to have to search my blog from last x-mas for my super yummy gluten free ginger bread house recipe! We had so much fun decorating it last year and an ipod touch is definitely worth the effort!! I follow your blog. I would love to win!! And yes. I know you love a challenge, so I cannot wait to see what you whip up, my friend! Oh what a great giveaway! We have only ever made one gingerbread house and it was UGLY and tasted horrible (from a kit) – what a great link to the hearth and soul hop. – thanks! Can’t wait to see you for Christmas! I’ll see what I can do about this! Even before I got it in my inbox, I’ve been excited about this gingerbread house contest since Shirley mentioned it to me. Such an awesome contest Kim! Not sure if I will enter since I have zero creative skills in that area, but can’t wait to see the entries!! Alisa, do NOT knock your creative skills. From what I have seen you are definitely NOT lacking in that department! LOL But no worries. Just join in on the fun! Is the deadline by midnight tomorrow, or by some other time? I really, really want to enter it but am still baking the dang house!! Pesky life, getting in the way of my fun, lol. What a fantastic idea & a cheerful way to celebrate the holiday season! I’ve been baking & building gluten- and allergy-free gingerbread houses for a couple weeks now with my kids and friends’ kids when they’re over for play dates. I hosted a kid’s class last year at this time where we built and decorated these allergy-free houses and it was such a moving experience to see all these kids having such a great time with it — kids who previously couldn’t partake of such a fun, creative way to enjoy the holidays with their families. I was on the CBS NEWS in DC last week with my allergy-free gingerbread house — so fun! Thanks again for hosting this fun contest! I posted this question on the main page, but this is probably a more appropriate place to ask: Can I upload more than one picture of my gingerbread house? It has several elements to show, and they cannot all be seen in one single photo. Thanks so much. #9 is a winner because of all the details and colors. I vote for number 9, the most beautiful ginger bread house…. #9 has my vote. It is charming, delightful and looks delicious! A true work of art! #9 how beautiful and detailed. Looks like it should be on a magazine cover! #9 is amazing and has my vote. #9 is my vote because it is gorgeous!! #9 is beautiful and looks so tasty!! #9 GETS MY VOTE!!! It is the most intricate in details and complete scene. I vote #9. Best overall. Mine turned out to be a distaster! LOL. The icing wasn’t holding it together enough. Bummer! #9 love the detail work!